It's Fairly Simple: Buy Fair. Be Fair. Ahh… breathe in the smell of Fall. It’s October and it's time to trade in sandals for boots, swap beach bonfires for cozy nights indoors and start sipping your favorite seasonal beverage. But October also marks the tenth annual Fair Trade Month! This is the perfect time to Be Fair and celebrate the global impact of Fair Trade. Throughout the month, check out BeFair.org to learn about educational events, giveaways and to raise awareness, promote Fair Trade and make your community the fairest of them all! This year’s campaign is Buy Fair. Be Fair. Just as we teach our children to be fair and treat our family and friends likewise, we can practice fairness through our purchases. At a young age we learn not to cut in line, to turn off the light when leaving a room, to share. So why not extend that same fairness to the farmers and workers who produce the quality goods we love so much by buying Fair Trade Certified products? From the 2013 Be Fair survey results, we discovered that Americans overwhelmingly demonstrate fairness in their everyday lives. Check out the survey and see how you measure up. The majority of Americans aspire to include fairness in their shopping habits, but only 18% of Americans regularly buy Fair Trade products –so much more can be done! When you purchase a Fair Trade certified product, you are investing in the growth of local economies, protecting the environment and ensuring the workers responsible received fair compensation for their hard work. A simple way to show your support, is to swap out one item in your daily routine – like trading in your cup of coffee or that banana for the Fair Trade version. Exchanging your usual cup of joe for a delicious, steaming mug of Fair Trade certified coffee can also get your creative juices flowing, so you’ll have more energy to tackle the day! 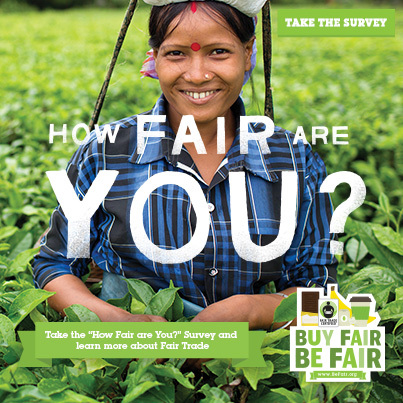 Take the Fairness Survey to see how your fairness measures up against friends and family.Turn the quiz into a friendly competition and have the loser buy fair trade chocolate for the group. Read, watch and share information about the impact you can make when you Buy Fair. 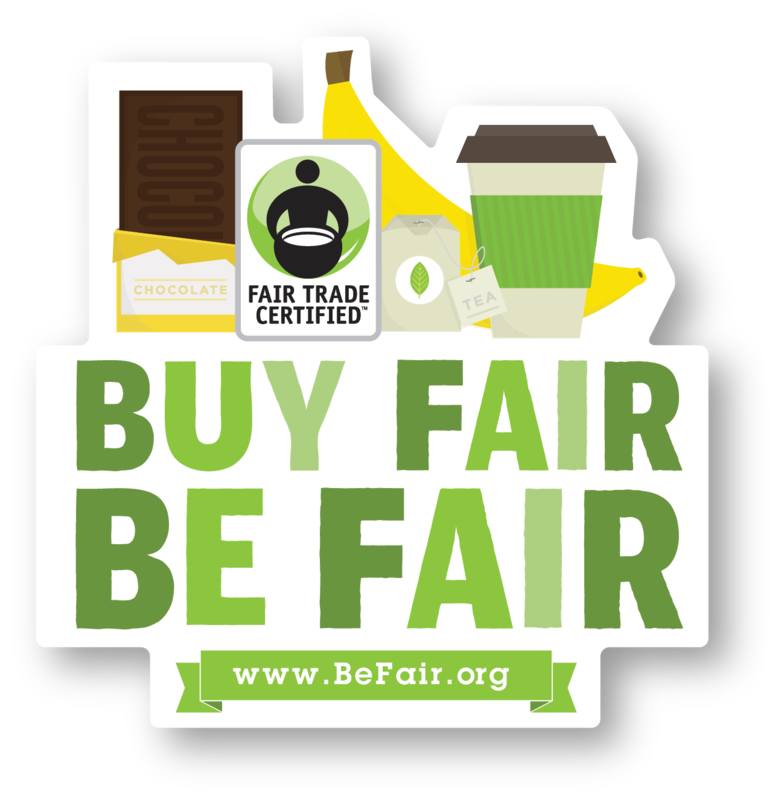 Join the #BeFair social media community for daily Fair Trade giveaways. Start or join a Fair Trade Campaign in your town or school. These local groups provide a great opportunity to meet other Fair Traders in your area and connect your community to those in the developing world. Donating to Fair Trade USA can have a huge impact for farming communities around the world. Show your fairness by making a donation today. Look for the Fair Trade Certified label and Buy Fair. If you are unsure if a product is Fair Trade certified, use Fair Trade USA's database to check. HOW FAIR IS YOUR TOWN? If you thrive off of friendly competition, check out the 2013 Be Fair Survey rankings. Philadelphia reigns champion followed by Boston and Dallas, Ft. Worth. If your city didn’t make the rankings, Fair Trade Month is the perfect time to raise awareness and rally your hometown to take the lead next year.